Between roller derbies, hockey games, birthday parties, and ice skating lessons, ice and roller skating rinks attract a lot of customers daily. For most of those customers, renting a pair of skates is usually just a part of the skating experience. On days where there are lots of people eager to get into the rink, it is not always possible to allow adequate time for skates to dry out. However, the last thing anyone wants to do is wear a pair of roller skates that are damp with someone else’s sweat. 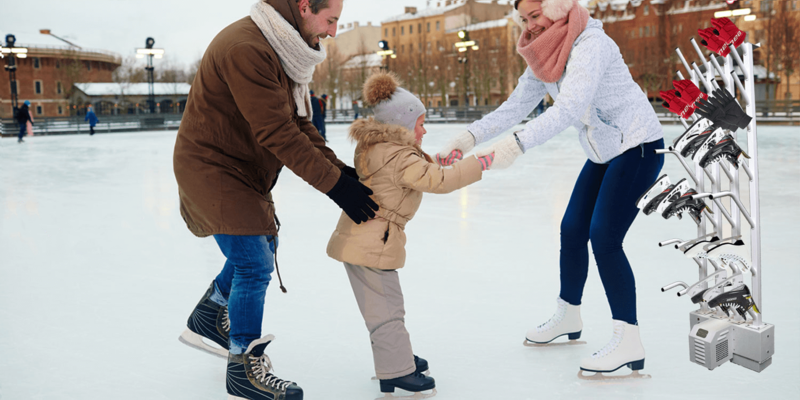 If the skates are not dried and sanitized between uses, they will become a breeding ground for germs and bacteria. Sweaty, germ-laden skates can cause your business' reputation to go downhill. 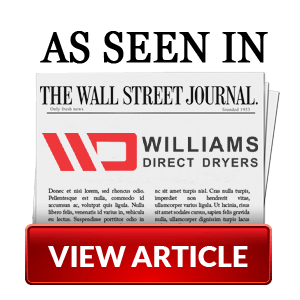 Protect your business and your skates; invest in an ice skate dryer from Williams® SportsDryer™. Our skate dryers use either ambient or forced air to dry the skate from the inside out without damaging it. In contrast, other skate dryers use hot air to force skates to dry as fast as possible. This method is ineffective and can damage the lining of the skate, causing burn marks or melting the glue that holds the skate together. Our skate dryers reduce the rate of replacement for ice skates, roller skates and hockey skates. Roller skating rinks and ice rinks should always care about keeping their guests safe from sweaty skates. Skates that take too long to dry can harbor germs that spread ring worm, athlete’s foot and other conditions from customer to customer. Our state-of-the-art drying system eliminates bacteria, while drying and warming each skate. Your customers will thank you for this level of care. 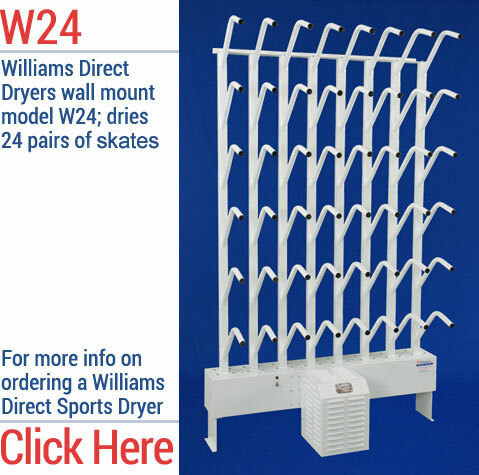 Whether you want permanent wall units for your commercial ice skating or roller skating rink, or you need a portable skate drying solution for competitions and games away from home, you can rest assured that you are looking out for your customers and your assets. Contact us about custom-designing a skate drying system today!